Raumfahrt - Op-ed Lunar Gateway or Moon Direct? Raumfahrt - Its a Bird! Its an Angel! No, Its Falcon Heavy! Raumfahrt - Self-taught rocket scientist plans launch to test flat Earth theory/A flat-earther finally tried to fly away. His rocket didn’t even ignite. 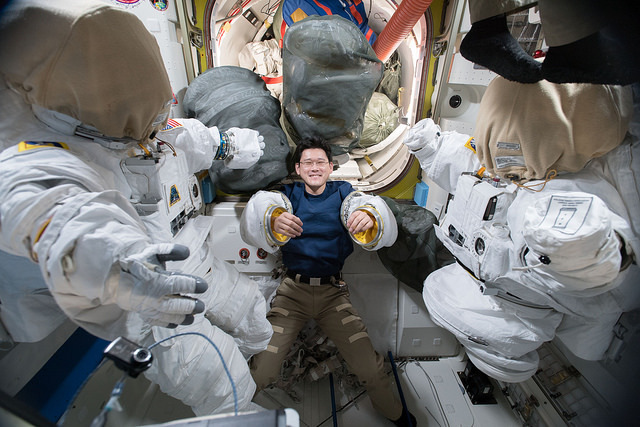 Astronaut Norishige Kanai of the Japan Aerospace Exploration Agency tries on a pair of spacesuit sleeves inside the Quest airlock on Jan. 2, 2018. Download a high-resolution version here. NASA astronaut Mark Vande Hei captured this selfie with his helmet visor up during a spacewalk on Jan. 23, 2018. Two astronauts will venture outside the International Space Station Thursday, Feb. 15, to move components for the station’s robotic system into long-term storage. 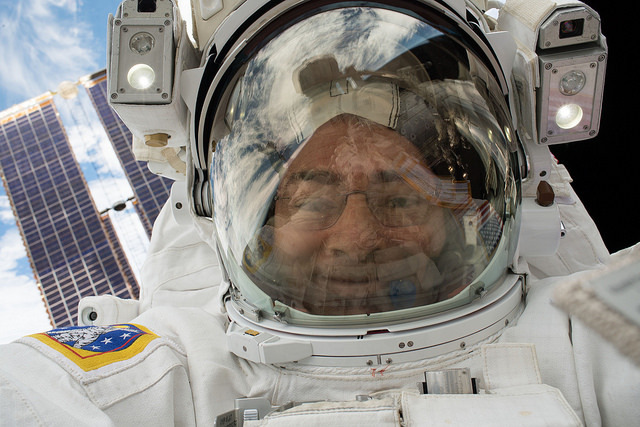 Live coverage of the spacewalk will begin at 5:30 a.m. EST on NASA Television and the agency’s website. Expedition 54 Flight Engineers Mark Vande Heiof NASA and Norishige Kanai of the Japan Aerospace Exploration Agency are scheduled to begin the spacewalk at 7:10 a.m. and finish about 1:40 p.m. The two spacewalkers will move a Latching End Effector (LEE), or hand, for the Canadian-built robotic arm, Canadarm2, from a payload attachment on the station’s Mobile Base System rail car to the Quest airlock. This LEE was replaced during an Expedition 53 spacewalk in October 2017, and will be returned to Earth to be refurbished and returned to the orbiting laboratory as a spare. They also will move an aging, but functional, LEE that was removed during a Jan. 23 spacewalk from its temporary storage outside the airlock to a long-term storage location where it will be available as a spare part for the Mobile Base System, which is used to move the arm and astronauts along the station’s truss structure. The spacewalk originally was scheduled Jan. 29 but was postponed when a new LEE installed during the Jan. 23 spacewalk encountered startup issues. Those issues were resolved Jan. 27 through software updates written by Canadian Space Agency robotics specialists. The spacewalk will be the 208th in support of space station assembly and maintenance and the third station spacewalk this year. The spacewalk will be the fourth spacewalk in Vande Hei’s career and the first for Kanai, who will become the fourth Japanese astronaut to walk in space. Vande Hei will wear the suit bearing the red stripes and Kanai’s suit will have no stripes.